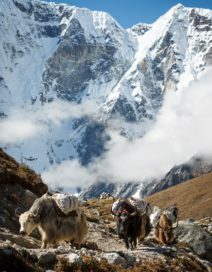 Trek Climb Ski Nepal offer a range of Everest Base Camp Treks to suit every budget and timeframe. All our trips meet world-class acclimatisation and safety standards helping our trekkers achieve a 100% success and safety record. An Everest Base Camp Trek is the benchmark adventure when it comes to trekking in Nepal. Enjoy every highlight this classic trek has to offer with our incredible Sherpa team. All-inclusive package. The famous Everest Base Camp Trek with all the inclusions you need to be successful. Our value itinerary includes one night only at Gorak Shep and a slightly quicker return trek to Lukla. Saving you 2 days and a few dollars on our classic trip option. Our budget Everest Base Camp Trek is the perfect option for those short on time or money. Fulfil your dream of achieving Everest Base Camp without taking shortcuts on quality or safety. Probably the most famous trek in the world, our Everest Base Camp via Gokyo Lakes Trek includes every highlight this incredible adventure has to offer. Given the challenging nature of this trek, we’ve included plenty of time for you to rest and recover from the big days along the way. The famous Everest Circuit Trek in 19 days. A shorter version of our Everest Base Camp via Gokyo Lakes itinerary designed to suit those with less time. Trek Climb Ski Nepal was founded by Tika Tamang and Nick Farr in 2006. Since then, we’ve run hundreds of expeditions all over Nepal. Given so many of our guests want to trek the famous Everest Base Camp route, we decided to offer a range of options to suit every budget and timeframe. Regardless of the trek you choose, your itinerary will adhere strictly to our world-class acclimatisation and safety protocols. This is just one of the reasons we have a 100% safety and success record running Everest Base Camp Treks for more than 12 years. The other is our team. All of our trip leaders have been guiding Everest Base Camp Treks for more than 20 years. Most have completed this journey in excess of 100 times. And if that doesn’t scream “experience” loud enough, most of our trip leaders have also climbed Mt Everest. So not only are they trekking guides, they are veteran mountaineering guides too. It is this level of expertise that means in the very rare event something doesn’t go to plan, your qualified guides know exactly how to respond. Quickly, safely and professionally. Watch videos from past Trek Climb Ski Nepal Everest Base Camp Treks.